Asia Pacific Superyachts is now acting as the agent for yachts over 30 meters for the Royal Langkawi Yacht Club (RLYC). The exclusive establishment, with a beautiful marina situated on the mystical island of duty-free Langkawi, has added new berths in and an extraordinary renovation and expansion of the entire marina. “We are thrilled to be part of the new Royal Langkawi Yacht Club & Marina, moving our Asia Pacific Superyachts (APS) offices smack into the middle of the newly renovated RLYC, where we will continue to work with arriving Superyachts”, enthuses APS Langkawi GM, Captain Charlie Dwyer. “I view the presence of APS at RLYC as a strong alliance in driving more Superyachts to the waters of Langkawi”, added Sumdran, noting the Club & Marina is located on the south-east of Langkawi, close to Kuah which is the main town and the island’s jetty point for ferries between the mainland and Langkawi - providing easy access for Superyacht visitors to shopping, dining, entertainment, sports, transport and other businesses. The offices of Immigration and Customs are also within walking distance from the marina. A duty-free island paradise, captains and owners can reap significant savings in duty-free and refit services. The Club & Marina was designed and built to blend into the natural coast line and landscape of the island. Its imposing yet elegant structure is shaped to resemble a ship’s hull pointing towards the open sea and houses the main clubhouse. 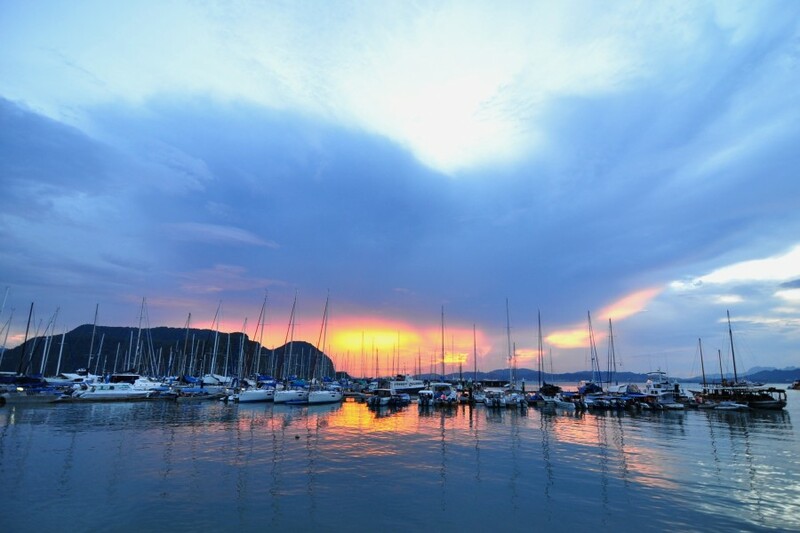 Since its opening in 1996 the Royal Langkawi Yacht Club has positioned itself at the forefront of the rebirth of boating in Malaysia, growing in tandem with the island’s development to emerge as the heart of sailing and yachting on Peninsular Malaysia’s northwest coast. The Langkawi marina upgrading and expansion from 200-berths to a 250-berth marina includes 6-berths to accommodate superyachts; 4-berths for 60-70 meter Superyachts and 2-berths for 80-90 meter Superyachts. The Superyacht berths are fitted with power pedestals of 400Amps for the 80-meter berths and 250Amps for the 60-meter berths. Other new berths are of 17-meter and 20-meter length. The existing marina has been refitted with brand new electrical cables, new water pipes, fire-fighting system and new fuel dock system along with a newly planned Pump Out station. The redevelopment is targeted for the re-opening stages starting late November 2015 with full completion expected by end January 2016. Target dates are subject to various conditions and hopes are high that all will go well, according to Mr. Sumdran. The Royal Langkawi Yacht Club has proudly put itself on the global map as a premier yacht club and marina, offering impressive facilities and close-to-shore pontoons with a low tide depth of 3 meters minimum. All pontoons have direct electricity, fuel and water supply and offer Wi-Fi internet connection.